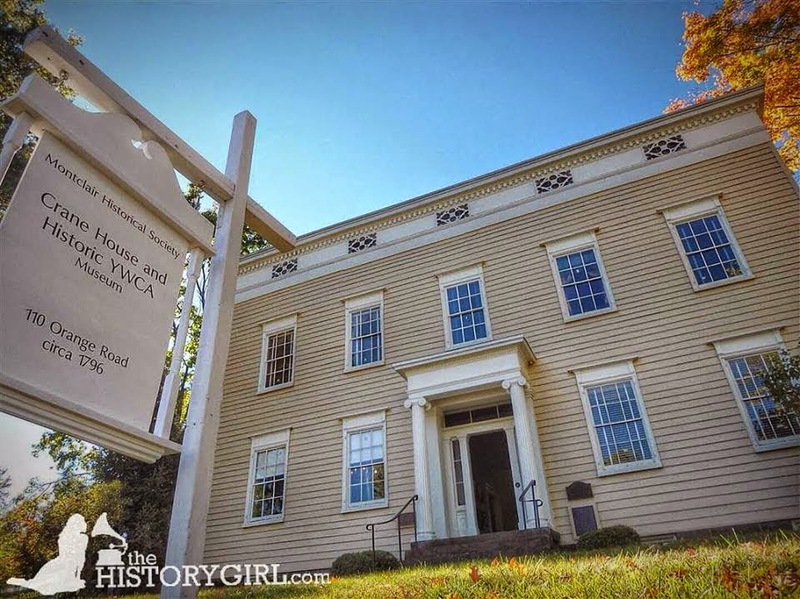 NJ Weekend Historical Happenings: 2/13/16 - 2/14/16 ~ The History Girl! Joseph W. Hammond, Curator of Museum Collections for Monmouth County Historical Association, will host a gallery workshop at 10:30 am on Saturday. The workshop will highlight pieces from the Of the Best Materials and Good Workmanship: 19th Century New Jersey Chairmaking exhibition now open at the Museum, 70 Court Street in Freehold, NJ. The special workshop will give attendees the opportunity to explore the history of chair production throughout New Jersey. The workshop will begin with a general introduction to the production of chairs throughout the Garden State. It will be followed by a comprehensive tour of the exhibition in the Washington Gallery, focusing on details in each of the four sections of the exhibition: the Craft of Chairmaking, Windsor Chairs, Common Chairs, and Factory Made Chairs. There will be ample opportunity for questions and a closer examination of the many historic pieces on display. This workshop gives participants the opportunity to study items not normally available to the public in a single setting. The workshop will last approximately 90 minutes. Tickets are $10 per person. Reservations can be made by calling 732-462-1466 x11 or e-mailing pgithens@monmouthhistory.org. Monmouth County Historical Association is a private non-profit organization that has been working to preserve history and provide educational opportunities since its founding in 1898. The Historical Association’s Museum and Library is located at 70 Court Street in Freehold, NJ. Museum hours are: Tuesdays - Saturdays 10:00 am - 4:00 pm. The Library is open Wednesdays through Saturdays. 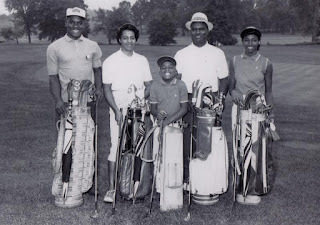 For more information about the Association, call 732-462-1466 or visit www.monmouthhistory.org. Shrewsbury, the second oldest town in Monmouth County, once included land from the Navesink River south through today's Ocean County in its entirety. This illustrated lecture by Monmouth County historian Richard Geffken explores Shrewsbury's colonial past and the compelling role of the Shrewsbury Quakers in the abolition of American slavery. Copies of Mr. Geffken's newly published book will be available for sale. The program begins at 1:00 pm and admission is $10.00 for non-members and $8.00 for members. Complimentary light refreshments will be served. The William Trent House is located at 15 Market Street in Trenton, adjacent to the Hughes Justice Complex. Ample free parking. For more information, call 609-989-3027 or visit www.williamtrenthouse.org. A little history and fun for the whole family! The Passaic County Historical Society is offering a free craft activity for children of all ages on Saturday from 1:00 pm - 4:00 pm at Lambert Castl, home of the Passaic County Historical Society. Learn about early Valentine cards and the evolution of the holiday and also have a chance to make your own Victorian style Valentine. This activity is free with regular museum admission. The activity will be ongoing throughout the museum's open hours. Passaic County Historical Society, a 501(c)(3) non-profit, was founded to cultivate interest among individuals and the community-at-large in the rich history of Passaic County. To this end our museum in Lambert Castle showcases examples of the County's cultural and artistic diversity, as well as examples of the County's natural, civil, military, and ecclesiastical history. The Society also maintains a library and archive, which houses manuscripts, books and photographs of historical and genealogical interest. The incurably romantic can warm-up for Valentine's Day at Howell Farm from 10:00 am - 4:00 pm. For our married or courtin' folks we offer the Farm's circa 1900 horse drawn sleigh (or carriage) for rides. Families and groups will enjoy a horse drawn bobsled (or wagon) ride. Weather permitting rides are offered free, on a first come, first serve basis. Hot chocolate and a hand warming fire are among the outdoor amenities. Visitors can purchase cakes, cookies and other delights, as well as hearty lunch fare in the Visitor Center. Valentine treats will be available for purchase to eat at the farm or to take home for that special someone. The Walns sent Valentines, do you? Sweet, silly or sentimental, Valentines have been exchanged for centuries. Drop in and see some beautiful 19th century Valentines on display at Walnford in the main house; then create your own token of affection for your heart’s desire to take with you (Appropriate for ages 5 and up, accompanied by an adult). Program runs from 1:00 - 4:00 pm. On Saturday, the Cape May Lighthouse, Oil House and Museum Shop reopens for the season.The lighthouse is an 1859 structure with 199 steps to the watch gallery for a panoramic view of the Jersey Cape and Atlantic Ocean. For those who choose not to climb, the Oil House contains a fully-accessible Visitors' Orientation Center and a Museum Shop stocked with maritime accessories and lighthouse memorabilia. Open 12:00 noon - 3:00 pm on Saturday, Sunday, and Monday. Cape May Point State Park is located in Lower Township, NJ. Admission to the Visitors' Orientation Center and the ground floor of the lighthouse is free. Tower admission is $8 for adults, $5 for children (ages 3-12). Sponsored by the Mid-Atlantic Center for the Arts & Humanities (MAC). For more information, call 609-884-5404 or 800-275-4278 or visit www.capemaymac.org. Take a slide show tour of downtown Princeton and the University campus, presented by one of HSP's walking tour guides. Participants can enjoy refreshments while learning about the early history of Princeton, the founding of the University, and the American Revolution. Included with $4 museum admission to the Updike Farmstead. Regular walking tours resume March 6. Updike Farmstead is located at 354 Quaker Road, Princeton, NJ. The virtual tour begins at 2:00 pm and ends at 3:00 pm. For more information, call 609-921-6748 or visit www.princetonhistory.org. Step back through over 200 years of American history at Montclair's historic properties at 108 Orange Road. Visit the reinterpreted Crane House to reflect the YWCA period from 1920 - 1965, check out the farm, and meet the chickens. The site is open from 1:00 - 4:00 pm. 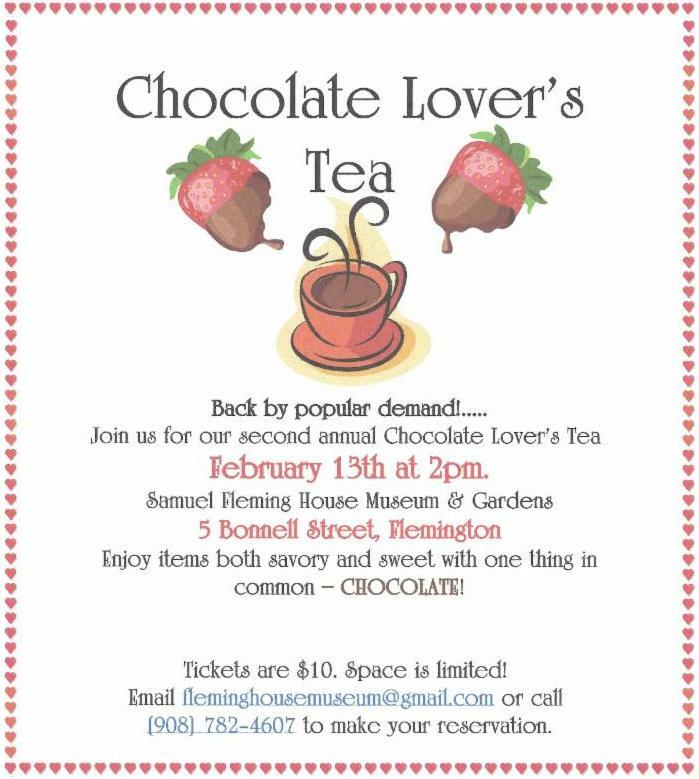 Make a Victorian Valentine and other activities designed to introduce children to history in a fun and interactive way. Docents will take kids on a scavenger hunt for the hidden heart designs on our artifacts in each room of the house. Tours for families on the hour and the last tour begins at 3:00 pm. Food Historian Carolina Capehart will be demonstrating in the hearth. Admission is $10 per family. For more information, call 973-744-1796, e-mail mail@montclairhistorical.org, or visit www.montclairhistorical.org. George Washington was the "poster boy" of the late 18th century. Everyone wanted a copy of his image. Learn how Washington's image became an icon while viewing busts and paintings of Washington on a gallery tour of the museum. The gallery tour will take place at 12:15 pm and again at 2:15 pm and is included in the $7 museum admission fee. The Ford Mansion and Washington's Headquarters Museum is located at 30 Washington Place, Morristown, NJ. Cost: $7 per person 16 and older. For more information, call 973-539-2016 ext. 210 or visit www.nps.gov/morr. Absecon Lighthouse is hosting its annual "Evening of Romance and Renewal" for Valentine's Day, Sunday, February 14th. Couples are invited to take part in a group Vow Renewal ceremony by a non-denominational minister in the Keeper's Cottage at 6:0 pm, followed by a champagne toast of congratulations and romantic dancing to the tunes of PJ the DJ. What better way to set the mood for a romantic dinner out in Atlantic City afterward? A donation minimum of $40 per couple includes the ceremony, tower climb, DJ dancing, and champagne toast, but couples are asked to "give from the heart," as this is a fundraising event. Doors open at 5:30 pm - the event concludes at 7:30 pm. You are invited to make a reservation by calling the lighthouse at 609-449-1360. As an added bonus on Saturday and Sunday, you and your date climb for the price of one! Absecon Lighthouse is a state-owned historic property administered by the non-profit Inlet Public/Private Association. Located at 31 So. Rhode Island Avenue in Atlantic City, NJ it is open to visitors Thursday through Monday from 11:00 am - 4:00 pm. For more information, call 609-449-1360 or visit www.abseconlighthouse.org. 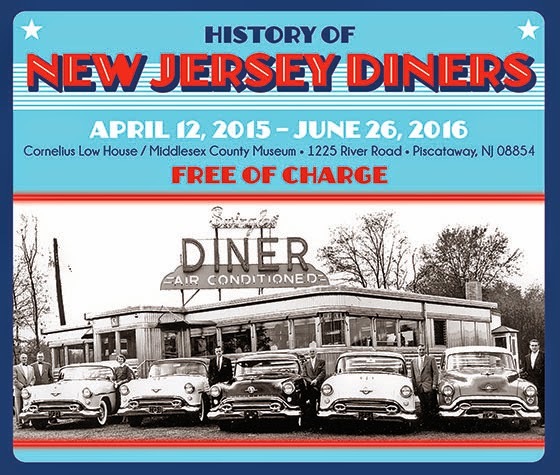 Don't miss the newest exhibition at the Ocean County Historical Society, 26 Hadley Avenue, Toms River, NJ. "All Aboard! A Brief History of Ocean County Railroads and Stations" will be on display through March 4, 2016, 10:00 am - 3:30 pm, Tuesday through Friday and the first Saturday of each month, 1:00 - 4:00 pm. Learn about the golden years from the 1880s to the 1920s, when six railroads were established and thrived, dotting Ocean County towns with stations, turntables, wyes, and roundhouses. View replicas of trains of the Central RR of NJ, Pennsylvania RR, The Blue Comet, the Tuckerton RR, and the Doodle Bug Car on the New Egypt line. Authentic artifacts and historic photographs of stations that were centers for community activities, as well as transportation of passengers and freight, make this exhibit a must-see! For more information, visit www.oceancountyhistory.org. Deep inside most museums is a hidden cache of artifacts deemed too controversial for display. Due to their controversial nature, many of these items are seldom seen by the public. Many of these acquisitions remind us of issues from our past that some would like to forget. Like most places in our nation Cape May County's past also holds untold stories. As stewards of our local history, we feel it is our obligation to present these pages of history to the public. Under the direction of guest curator, Gwen Brownell Raring, the Cape May County Museum has put together an exhibit highlighting controversial artifacts from local collections, both public and private. Many of these items have never been presented for the public's view. We invite you to attend this thought-provoking exhibit. Admission to the exhibit is free to museum members and $5 per person for non-members. The Museum of Cape May County Gallery is located at 504 Route 9 North, Cape May Court House, NJ. For more information, call 609-465-3535, e-mail cmchgsmuseum@gmail.com or visit www.cmcmuseum.org. 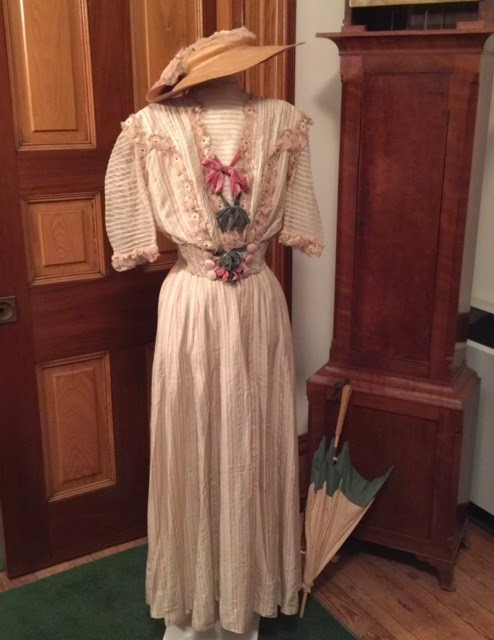 Gloucester Abbey: Downton Style Fashions is currently on display at the exhibit at the Gloucester County Historical Society Museum in Woodbury, New Jersey. The exhibit will conclude on January 6, 2016. This remarkable exhibit features ladies’ fashions from the society's collection from the time period covered by the popular PBS Masterpiece Theater series Downton Abbey. Over 100 vintage dresses/ensembles from the museum’s collection dating from 1910 through the 1930s are showcased, including period wedding gowns. Also on display are ladies accessories, including hats, shoes, purses, jewelry, and lingerie. Don’t miss this fantastic exhibit! The Gloucester County Historical Society Museum hours are Monday, Wednesday, and Friday from 1:00 - 4:00 pm, and the last Sunday of the month from 2:00 - 5:00 p.m. Private tours may be booked for days/times other than our regular public hours. Adult admission $5; children 6-18 years $1; children under 6 free. The Gloucester County Historical Society Museum is located at 58 N. Broad Street, Woodbury, NJ 08096. For more information, call 856-848-8531 or visit www.rootsweb.com/~njgchs. When was the last time you ate at a diner? If you are like millions of New Jerseyans, the answer is not too long ago. Dubbed “the land of diners,” New Jersey has forged a unique relationship with these casual eateries. Stainless steel, neon, and menus that go on for days are part of the Garden State landscape. Come explore their rich history with us! This seven-room exhibit tells the story of some of the of the Garden State’s most iconic eateries. This exhibit runs from April 12, 2015 - June 26, 2016 and is free of charge. The exhibit is open Tuesday – Friday from 1:00 – 4:00 pm and Sundays from 1:00 – 4:00 pm. Closed Mondays, Saturdays, and Holidays. The Cornelius Low House Museum is located at 1225 River Road, Piscataway, NJ. For more information, call 732-745-4177 or visit www.co.middlesex.nj.us. Monmouth County Historical Association's newest exhibition Of the Best Materials and Good Workmanship: 19th Century New Jersey Chairmaking at the Museum at 70 Court Street will remain open through July 9, 2016. 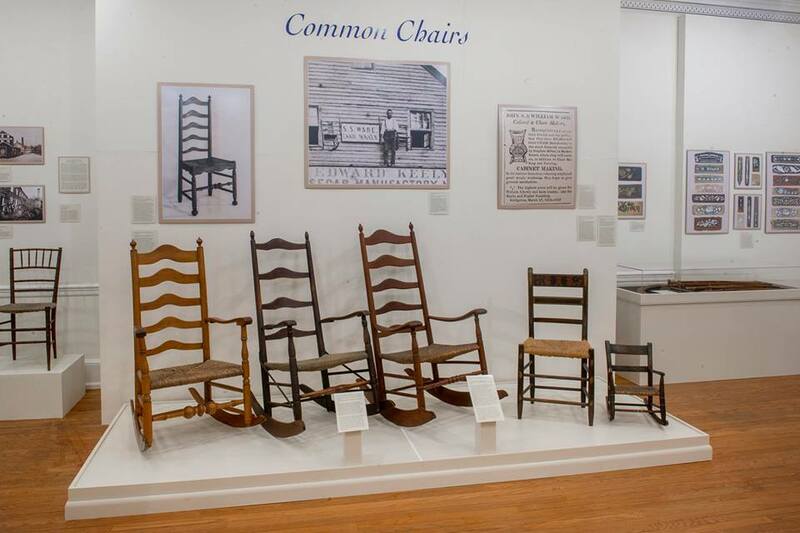 This exhibition explores the diversity of products made by chairmakers in New Jersey from the late 18th century through 1900 and explores four different galleries: the craft of chairmaking, Windsor chairs, common chairs, and factory made chairs. It draws from chairmakers from throughout the Garden State, including a large collection of chairmaking tools, equipment, benches, patterns and stencils collected by William H. MacDonald of Trenton. MacDonald, who had one time worked in Freehold, donated the collection to the Association in the mid and late 20th century. The exhibition represents the first time the entire collection of tools, equipment and patterns have ever been displayed together. Hammond explained that the name for the exhibition is taken from the language commonly used by New Jersey manufacturers in their newspaper advertisements promoting themselves against craftsmen from New York and Philadelphia. Many of the items in the exhibition come from throughout the Garden State, from Bergen to Cumberland and Salem counties, and span the era from 1780 to 1900. Some of the items on display are on loan from several different historical societies as well as the Rutgers archives’ special collection and are representative of both local and regional chairmakers. Of particular interest is one section devoted to the Ware family of Cumberland County, a family that represents a unique chapter in the history of American furniture production. 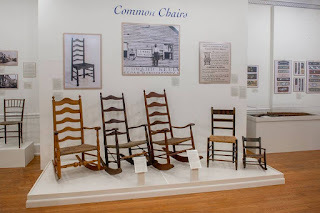 Nineteen members of the family spanning four generations made traditional slat back, rush-seated chairs in the Delaware Valley tradition from the late 18th century to about 1940. The gallery portraying factory made chairs includes perforated furniture made by Gardener and Company in 1872, a business in Glen Gardner, folding chairs popular on ocean liners dating back as far as 1868 and made by the Collignon Brothers in Closter, in Bergen County, using wood from the sawmill across the Hackensack River from the plant, and the Cooper Chair factory of Bergen, noted for its delicate chairmaking styles. The Gallery devoted to Windsor chairs includes the earliest known marked Windsor chair, one made by Ezekiah Hughes in Salem County in the 1780s. The exhibition at the Museum displays one of the largest collections of Windsor chairs ever shown.